By Rachel Leigh - Express Newspaper Nelson, B.C. Tim and Becky Rippel of Nelson's Peak Freaks are organizing a clothing donation drive for Nepalese Sherpa children. Increased tourism in Nepal's mountains has encouraged an influx of Nepalese families to the Mount Everest region, but recent international events have had a devastating effect on the country's tourist industry. SARS and 9/11, along with Maoist rebels in western Nepal have discouraged visitors and left many Sherpas without work. The Rippel's have over 18 years of experience leading mountaineering expeditions in Nepal, have developed strong connections with the Sherpa families who live and work in the Mt. Everest region. When Tim leaves next month on his latest Nepalese expedition, he hopes to help alleviate poverty by sending each of his climbers with an extra expedition bag of clothing to add to their allowable baggage allowance. Because of the wide varying temperatures at different elevations, both summer and winter clothes are needed. They're looking for clothing in good condition in sizes from two to adult; they will clean all donations. If you have no clothes to give but still would like to help, the Rippel's would also welcome computer software for Nepalese schools. 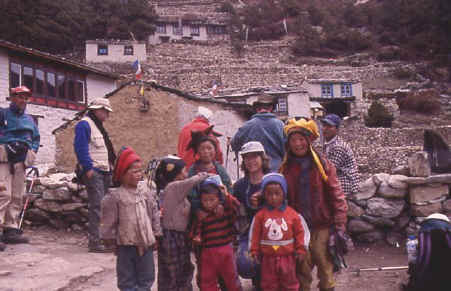 Photo: Becky Rippel passing on hats to the children in the Khumbu hand made by a women in Nakusp, B.C. Trekkers helping support good oral hygiene and dental care in the Khumbu Valley. Sonam Sherpa shown in the photo works with Peak Freaks with his team of Yaks. His smile was infectious with the missing tooth but unfortunately also infectious was the pain he endured from rotting teeth. Sonam was sponsored by one of our trekkers a flight for the first time to a city, to Kathmandu. Escorted by his brother Dawa who also works with us as a climbing sherpa. The flight and dental work cost only 200.00 US dollars. Our trekkers and climber help in facilitating the transportation of vaccine to the Khumbu. Each year we load up essentials wherever possible to help the Kunde Hospital with their much needed supplies. Thanks to a dentist in the US this time we were provided with a box filled with tooth brushes and tooth paste. The hospital doctors used these supplies to entice the sherpa people to come in for check up so they could be looked at and a file opened for them. The sherpas have been afraid to go to the hospital as they believed that if you went there you would die. This gift changed that way of thinking and much as improved now. Allowing the doctors to identify problems before they became serious. Something so small did so much. THANK......YOU! T his venture was quite fun. We organized with schools in our home town Nelson, B.C. Canada an exchange letter opportunity. We brought books, pencils and other teaching aids to the school. We also delivered a hand full of letters from a grade 5 class in Nelson to a class at the Sir Edmund Hillary school in Khumjung. While we went off trekking the students wrote a reply to the children back home and we picked them up on our way back and delivered them back to Canada. Great fun! 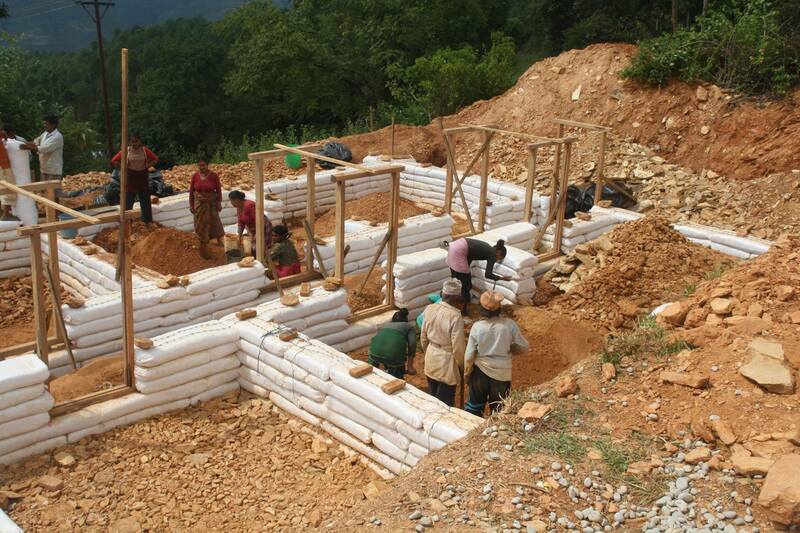 LIGHT UP NEPAL PROJECT- Putting light in the homes so Nepalese children can read and write at night. 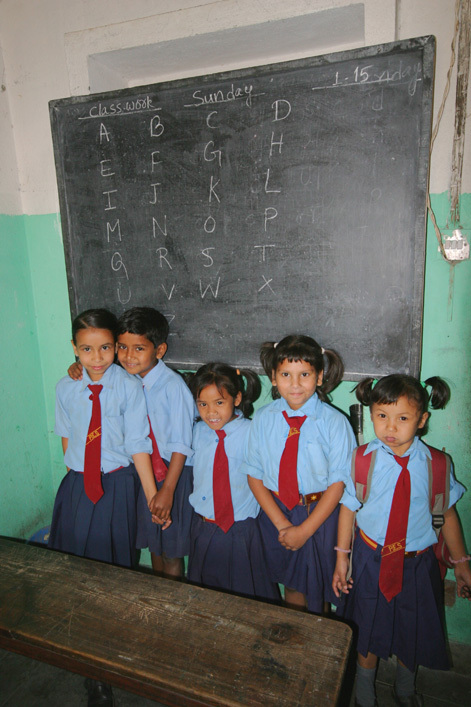 Learn for Life is a non-government, organization and charity that provides selected students with a paid-post secondary education, as well as a monthly living allowance that affords them independent living accommodations, away from Hopeful Home, the orphanage that they grew up in. This is truly the next step for these kids and a way to safely transition out of the safety net that has been their home for so many years. The program was developed by Vanessa Higgott now a Peak Freaks trekking guide. In October 2006, Vanessa & Guy Higgott traveled to Nepal to trek and climb with Peak Freaks. They fell in love with the country, but more importantly the people. Donations paid to Peak Freaks go towards helping with the high cargo costs to get the much needed items to Nepal.